Although there's much to love about each of the seasons, summer is my ultimate favorite simply because of the beach. And yes, the beach is beautiful in all of its seasonal glory but it's only in the summertime that you can dip your feet in and become one with the entire experience. Unless of course you're a member of the Polar Bear Club. Which I'm not. The sun, the sand and the murky water combine to leave us with a casual and comfortable feeling which in itself reflects a rustic romantic tone. 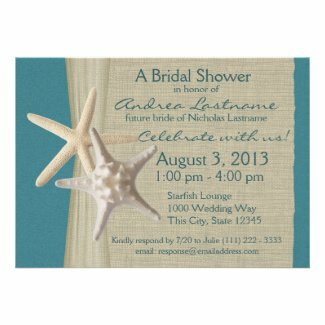 If the bride-to-be is a beach lover who enjoys a more shabby than chic lifestyle, or if the couple has chosen a rustic or beach wedding theme, I think you might have found the perfect invitations for their unique bridal shower. Each of the following 10 rustic beach bridal shower invitations shares an airy informal design with elements from the beach. You'll find seashells and burlap, driftwood and sand, tropical flowers and other fashionable nautical details that come together to make these some of the most spectacular shower invitations I've ever seen for a summer wedding. Browse through to see if you don't agree. 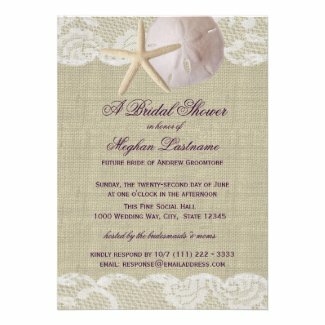 All of these gorgeous rustic beach bridal shower invitations are brought to you by the talented and beach-loving designers at Zazzle. They measure a big 5" x 7" (or 7" x 5" depending on the way you look at them) and each one comes with a white envelope. They're super easy to personalize with all of your pertinent information and range in price from $1.70 to $2.05 each. Click on your favorites to learn more and to see a larger image. And there's plenty more to see! Are you planning a rustic beach-themed bridal shower? What type of decorations are you using? Will the cake be homemade or store-bought? Is the wedding also going to have a beach theme? 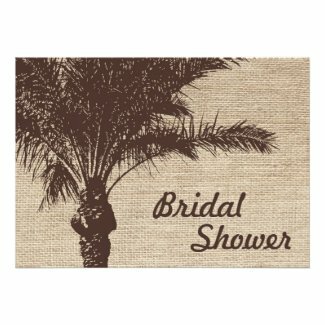 Feel free to share your unique ideas here in the comments section to help others plan their own rustic beach bridal showers. All photos that appear in this post were found through a creative commons search. Huge thanks to each of these talented photographers who were kind enough to make their work available for our viewing pleasure. Click each photo to see it at it's original source.